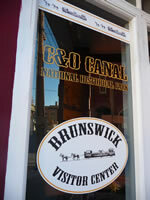 I find it exciting to stand at the edge of the newly restored Catoctin Aqueduct, its white stone glistening in the sun. 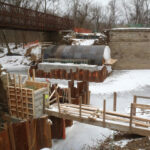 I came often during the restoration process to see the painstaking work of putting the aqueduct back together, stone by stone. Now, walking across this amazing structure, rebuilt mostly with its original stones, I marvel at the dedication of the people who made this possible. 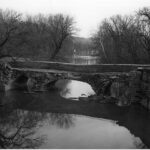 Known as the "Crooked Aqueduct," because boaters had to make a sharp turn to enter, the Catoctin Aqueduct's structural integrity was dubious from the beginning. 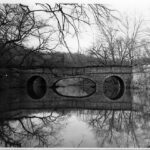 The elliptical center arch was not as structurally strong as the semicircle arches on either side and the aqueduct began sagging in the early 1900's. 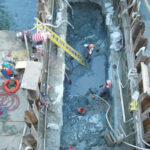 It leaked constantly and was prone to flooding, further undermining its reliability. 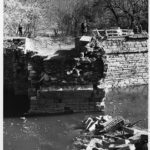 In 1973, just two years after Congress established the C&O Canal National Historical Park, two arches collapsed, leaving only a remnant of the eastern arch standing. 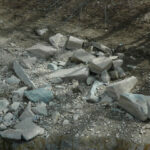 The park service salvaged and buried the original stones to help preserve them in case the aqueduct was ever restored. Community support for the project kept building. 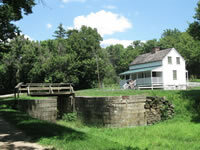 Finally, in 2007, the park entered into an agreement with the Catoctin Aqueduct Restoration Fund, Inc., to raise the funds necessary to restore the Catoctin Aqueduct. Their grass roots effort, including an Adopt-A-Stone program, raised over $2.5 million dollars. 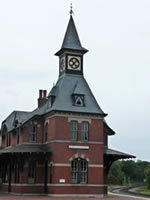 An American Recovery and Reinvestment Act grant in 2010 provided the remaining funds necessary to complete the project. Four hundred and fifty nine original stones were uncovered and used in the restoration. Each was like a puzzle piece in a 3-dimensional puzzle, having its own unique position and role. 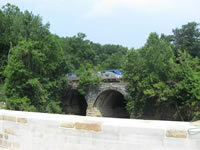 The park's engineering crew measured each stone and cut out foam patterns on the outer edge of the aqueduct. 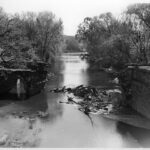 Historic photos were then used to identify where individual stones were positioned. Missing stones or those in poor condition were replaced. In a little over a year, construction was complete. Today, new viewing areas and waysides allow visitors to learn about the structure and the efforts to rebuild it. 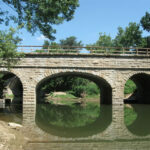 I invite you to visit the new and improved Catoctin Aqueduct and ponder the sweat and love that went into making it possible for us to once again enjoy its bright white stones shining in the afternoon light.